Assorted accommodations in the centre of Saariselkä, at just right price. Apartments Kuukkeli: Situated side-by-side in a semi-detached house close to Shopping Centre Kuukkeli, Apartments Kuukkeli consists of 10 different apartments in the center of Saariselkä. Each apartments are suitable for 1 to 6 persons. All the accommodation units are located in the very centre of Saariselkä, close to all local services. Bed linen, towels, the final cleaning and firewood (in the apartments equipped with a fireplace) are included in price of the accommodation. All the apartments and rooms are equipped with an efficient wireless Internet connection WI-FI. Apartments Kuukkeli is only 1-2-minute walk to the Shopping center Kuukkeli. Lodge Kuukkeli Teerenpesä, with pleasant natural atmosphere, is built with an old pine material of Lapland. It is located in the very centre of Saariselkä close to all local services. The bus stop near Teerenpesä serves all the buses and also the ski bus, as well as the airport transfers bus. An apartment Teerenpesue in a lovely blue-grey-white wooden row house for 1-6 persons located right at scenic centre of Saariselkä. This traditional looking apartment with modern facilities has amenities into two storeys. The apartments have two bedroom (separate beds for 4 people), livingroom (sofabed for 1 person) with tv and fireplace, kitchen, bathroom, toilet and sauna. Aparthotel Kuukkeli Aurora is situated 4 km from the center of Saariselkä, and 30 km from Ivalo airport, Aparthotel Kuukkeli Aurora is located in the beautiful 1.8 hector Taiga forest area in the Laanila area. The property has three different log-wood rental cabins plus one Sauna building. All accommodations have possibility to use the large living room with TV, sofas, kitchen, and fireplace. It is a social place where people can come together, make fire, read books, eat in the common place, watch tv and such. In the Sauna block of accommodation, there are two saunas for mens and womens with an indoor swimming pool, equipped with a separate showers and changing facilities. Sauna facilities are free of charge for all customers for shared use every evenings. The Laanila area is very popular among the lovers for cross-country skiing. Aurora has a warm ski-maintenance room and a common cloth drying room in each cabins. Each cabins are made with an old style log-wood which makes a great experience to Lappish landscape in a peaceful environment. 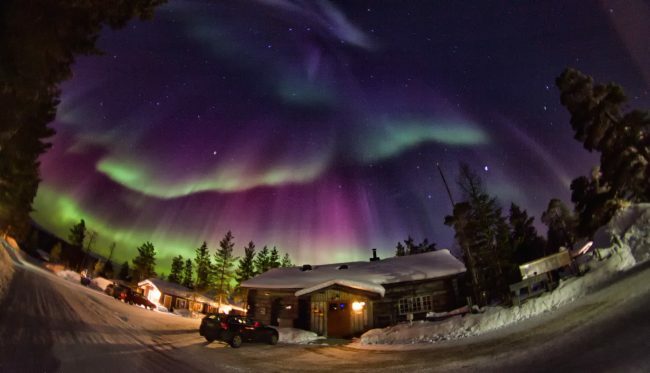 Being far from Saariselkä village and ski-resort light, Aparthotel Kuukkeli Aurora is a great place to see Northern Lights. No need to go far from your rooms/apartments. On top of that, this is one of the only rentals in Saariselkä area to have Sauna and indoor Swimming place in a beautiful wooden interiors for all guests who stay at this property.